After such a long, hot summer, a lot of venues seem to be choked with weed. Has the water you’re fishing suffered from an abnormal weed growth and, if so, how are you combating it within your fishing? My fishing this year and the venues I’ve chosen to fish, have all been pretty normal compared to previous summers. I haven’t had to change much, or adapt my ways significantly, to try and combat abnormal weed growth when it came to my main water in the Colne Valley. I spent the main part of the summer on this 140-acre pit, in the highest temperatures of the year, and I went about my fishing as normal. I applied the same amount of boilies as I usually would and I pre-baited like I usually would. I tend to go heavy on the bait, particularly after the carp have spawned and I took this method there and had great success. It was my first year on the big pit and after talking to a couple of regulars they informed me that the fishing was slow compared to previous summers. I didn’t know any different and my approach definitely worked. I would find carp in all areas of the pit at the start of the campaign and I found myself fishing pretty much everywhere to start with. By the end of the summer though I only managed to find them in two big bays down one end of the lake. It has just come to my attention, via social media, that the oxygen levels were low in the void areas and that’s why the carp weren’t visiting them anymore. A very familiar sign on many waters, up and down the country, this year. There have been big debates on social media about giving the fish a rest, etc. At the end of the day though a carp is a carp, right? They survive and feed hard in much warmer temperatures than those which we’ve experienced here in the UK in 2018. The only real issue was the oxygen levels and the water quality they’re living in. Some lakes were starved of oxygen and many big fish died from it unfortunately. One of my local club waters has had major weed growth this summer. I don’t usually fish there for sessions as I use it for a quick-hit, stalking type of water these days. I managed a few nice fish from there on the floaters and unless you’re up for a day’s work with a weed rake then that’s the only way you could catch them in some areas. It’s top-to-bottom weed, so floater fishing was my preferred method. You have to be prepared though and step the tackle up and have a boat nearby to land them safely. This particular water is a lot shallower than the big pit and the weed growth was excessive this year. All in all, my fishing was standard summer time fishing for me with the same bite ratio as I would normally have – it’s obviously just a bit sweatier for myself than usual. I think I spent six weekends in a row sleeping under the stars – now that’s surreal for England. Roll on the autumn, as this is my favourite time of the year! The syndicate that I have been fishing this season, is one that I have fished on and off for several years now. Therefore I have built up knowledge of which types of weed grow and in which parts of the lake each one thrives in. Throughout the year the different weeds and weed growth in the lake constantly change, resulting in my methods used to fish throughout the year changing as well. At the beginning of this spring, when the lake started to warm up, the silk weed was the first to become active on the lake bed. Wherever I could find this fresh growth seemed to be winning areas, as it held an abundance of natural food sources. Moving into April/May and the start of this year’s heatwave and the weed in the shallower end of the lake started to grow vigorously, but wasn’t unfishable with the right techniques. On a particular day I found the fish feeding in the fresh tassel pondweed and the first thing I did was to collect some of the weed with a gripper-style lead to obtain the length of the weed that the fish were feeding in. This then allowed me to fish my chod rig at the right length and the beads at the correct distance from the lead. In recent weeks the weed types that were growing in the spring have died back and Canadian pondweed has started to become the dominant species of weed in the lake. A tool that I have used in recent years is the Deeper Pro Plus to inform me of the height of the weed and to help identify areas of low lying weed. This allows me to start pre-baiting and allowing the fish to keep these areas free of the Canadian pondweed. These areas that did have fairly thick weed growing have now been completely cleared by the fish and are now a regular source of action for me. Don’t be scared of fishing in the weed, do some research on the types of weed and their life cycle that are present and, with your own techniques, this information will allow you to stay one step ahead. Without doubt the weed growth has been exceptional this year and both the waters I’ve been fishing have top to bottom weed and in places it is 18 feet tall. Weed will always pose problems, although if you look at it in a positive light, weed can also be your biggest edge. A boat can make life easy, but be safe at all times! Let me explain, thick weed is a big attraction to carp and this in itself can narrow down the location of the carp. Once I’ve found them, it’s then that I decide on the tactics I’m going to apply. I’ll look for fishable areas using a marker rod but I’ll only use a 4oz lead to feel across the spots themselves, as a float will catch up in the weed making it less sensitive to clear areas. I look for lower lying weed to fish over and will often use a small, cast-able weed rake, to make a clear spot. This is a very underrated method of making a clearing within the weed. I’ve done this a lot this year, even to the point where there wasn’t a clear spot so I made one. It’s hard work but can really pay dividends. Rig-wise, I really do believe dropping leads has been one of the biggest fallacies in modern carp angling but in these weedy situations it really is a must to drop the lead! I use a helicopter presentation a lot, which means I can set the top bead to allow my rig to find its own natural position, so the deeper the weed the higher I’ll move the top bead. This year I’ve done very well on the Ronnie rig too but you cannot argue the effectiveness of the chod rig in these situations, where it has caught me countless carp from very weedy, seemingly unfishable areas. All my end tackle is stepped up at the moment to deal with the harsh environment – 18lb RM-Tec line in green and a braided hooklink combined with big hooks. 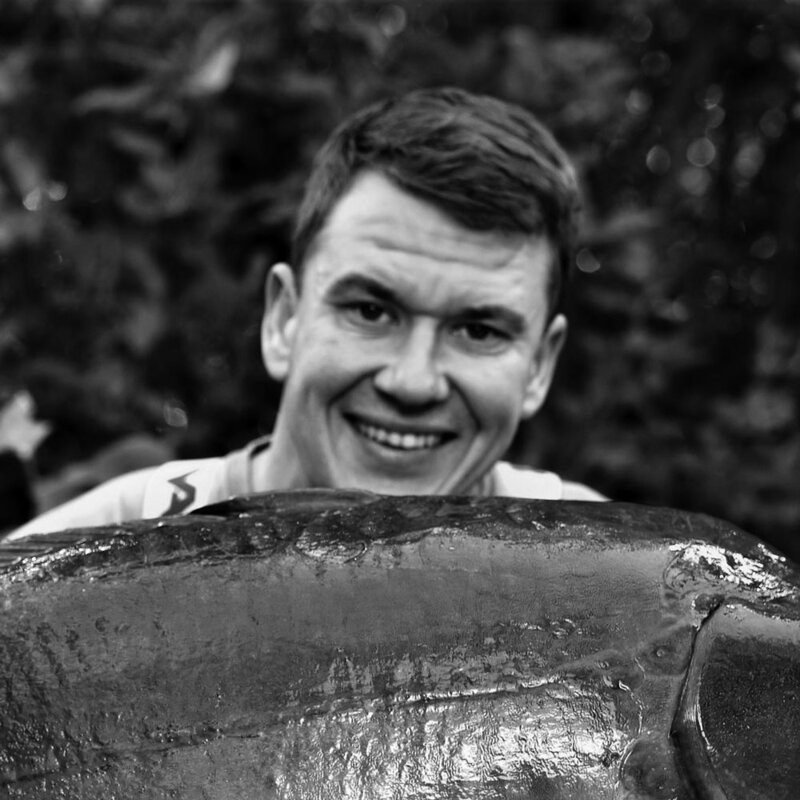 Bait presentation can also provide a big edge – don’t be putting out whole boilies, as they will fall straight through the weed. I will crush 90% of my bait and then Spomb it out. The end result will be that all the small broken food items will remain suspended within the weed. This kind of baiting pattern has the added bonus of keeping the carp rooting about for longer as well. It is only inevitable that the clear, gravel pits that I fish, have blossomed with an abundance of weed this summer. In fact it is something I have become accustomed to over a number of years and, given a little thought, preparation and effort, you can really swing the odds into your favour when it comes to combating weed. One of the most important things is to fish with strong and reliable end tackle. I use a very strong and robust mono in the form of ESP Synchro XT in 15lb, its parallel strength and abrasion resistance is pivotal in determining whether a carp is going to end up in the back of the net. There have, in fact, been a number of occasions this summer where I have not been able to find a clear spot. When I find myself in this situation I spend some time plumbing around with a bare lead to try and find thinner weed. I will then quite happily spend a few hours repeatedly casting a Gardner weed rake to the clip and gently dragging back a rod length before winding in and removing weed from the lake bed. It is far from a ten minute job but once a spot has been raked, I have found that fish can turn up to investigate in no time at all. Once the carp get on the particles that have been Spombed to the raked spot, if they feed well on the spot they will polish it right off. 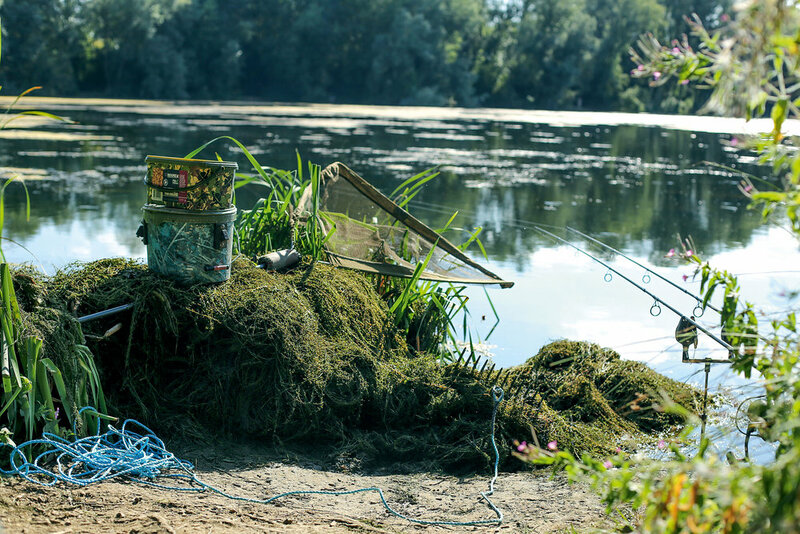 If this situation can be achieved, the spot will become established, carp will return to feed on a regular basis and you can really build an area that produces bites on a regular basis. One last thing I always do is to think in advance about if I were to get hooked up to a carp, how I would plan on landing it? Quite often, particularly on a windward bank, the rafts of floating weed can build up in the margins or close in and this can cause issues with landing fish. I always make sure I spend as much time as is needed to clear as much floating weed as possible. For this I have a large rake on a rope which I can throw up to around 25 yards which is usually more than enough to clear ample space to make landing fish a lot easier.